As a reader, sometimes I find books I love so much that I never want them to end. I want the author to dedicate all their time to creating more stories and adventures for the beloved characters. Usually that doesn't happen. A series ends, and I'm forced to say goodbye to my favorite characters. Except for Percy Jackson. While Rick Riordan has multiple books series about different characters, he still manages to continue the story of Percy Jackson through three different series. 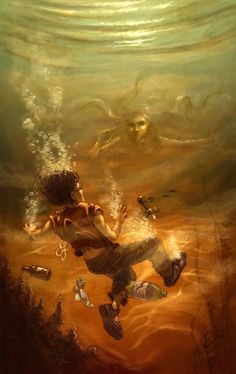 Thus I've been able to see Percy Jackson go from a twelve-year-old seaweed brain flying by the seat of his pants to a seventeen-year-old hero trying to get into college. It's heartwarming. Percy Jackson has been a favorite character of mine for quite a few years now. Over the course of eleven books--and the promise of more--I've grown to admire his character and even some of his faults. Despite his age and imperfections, I think Percy Jackson can be considered a literary gentleman. 'Because I'm your friend, Seaweed Brain. Any more stupid questions?'" -Annabeth Chase and Percy Jackson, The Lightning Thief, 251. 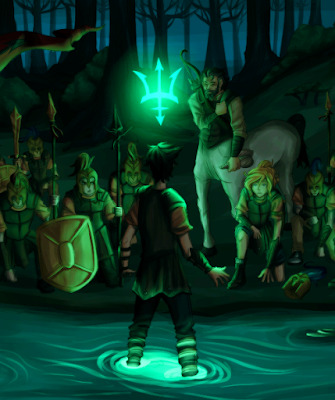 In the first series, Percy Jackson and the Olympians, Percy narrates the story. Thus we experience all his wandering thoughts due to his ADHD. Sometimes his brain goes all over the place, which adds a lot of humor to the more-serious events (like monsters attacking and friends betraying you). "The ADHD part of me wondered, off-task, whether the rest of his clothes were made the same way. What horrible things would you have to do in your life to get woven into Hades' underwear?" -The Lightning Thief, 310. In addition, Percy hasn't had the best life. He's always felt he was different, his mom married a terrible guy, and he doesn't know his own father. He's been kicked out of several schools due to bizarre events he can't explain, and he always feels that someone is out to get him (which is true). Thus, he has a lot of witty comebacks and sarcasm to combat the hardships of life. 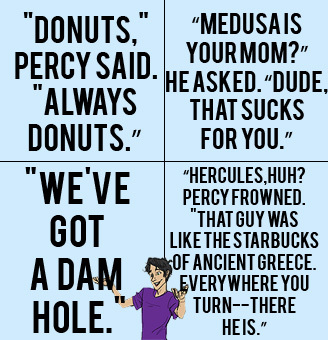 Percy Jackson is a funny guy, which makes him even more likable. If you don't believe me, just look at some of these chapter titles. Hilarious. Percy Jackson is unique because he's a demigod: half-human, half-god. It means he's different for a reason, for a purpose. Being a demigod usually means he gets himself in trouble, either by his own uncontrollable abilities or because monsters like to chase him. Yet being a demigod also means he has great power and ability. What he originally considers handicaps--his dyslexia and ADHD--are what make him heroic and set apart. 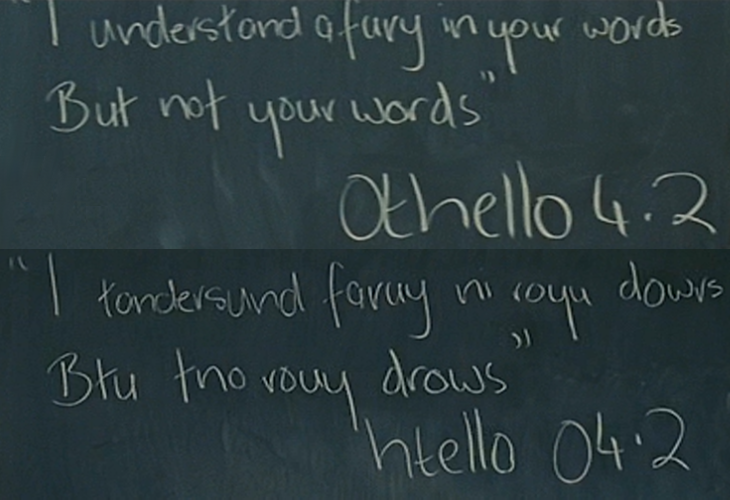 "'The letters float off the page when you read, right? That's because your mind is hardwired for ancient Greek. And the ADHD--you're impulsive, can't sit still in the classroom. That's your battle reflexes. In a real fight, they'd keep you alive. As for the attention problems, that's because you see too much, Percy, not too little. Your senses are better than a regular mortal's.'" -Annabeth Chase, The Lightning Thief, 88. In addition, he's the son of Poseidon, one of the "Big Three" gods. This means his abilities are even more powerful and he attracts many more dangerous monsters: "'Children of the Big Three have powers greater than any other half-bloods. They have a strong aura, a scent that attracts monsters'" (LT 114). It makes his life harder, but it also gives him greater resilience and strength. As a son of Poseidon, he is also under a lot of pressure due to a prophecy he might fulfill. This gives him purpose as he fights against Kronos. That's a lot of weight for one teenager to carry around, but he does it. His abilities make him an enchanting character (I mean, he can summon water and breathe underwater) and give us reason to read his story. It also helps him become the hero he's destined to be. Percy makes a lot of mistakes over the course of the books. A lot. Even before he knows he is a demigod, Percy gets himself into trouble: "See bad things happen to me on field trips" (LT 2). He has been kicked out of six schools, has failing grades, and has received detentions, probation, and suspensions many times. He isn't perfect. "What was so great about me? A dyslexic, hyperactive boy with a D+ report card, kicked out of school for the sixth time in six years." -The Lightning Thief, 38. As he learns of his true abilities, he still ends up making stupid choices. He likes to pick fights with monsters, and he makes rash decisions that put him into danger. When he fights the Minotaur to save his mother and Grover, he does something pretty stupid: he taunts the Minotaur. "The monster hunched over, snuffling my best friend, as if he were about to lift Grover up and make him dissolve too. I stripped off my red rain jacket. 'Hey!' I screamed, waving the jacket, running to one side of the monster. 'Hey, stupid! Ground beef!'" He also challenges Ares, God of War, to a fight when he has little experience of his own abilities (The Lightning Thief). He gets himself turned into a hamster because of his own low self-esteem issues (The Sea of Monsters). He follows the Hunters of Artemis, despite them refusing to travel with him, which leads him to a whole heap of trouble (The Titan's Curse). He gets himself injured, which results in Gaia, the Great Mother Earth, awakening and wreaking havoc upon the world (The Blood of Olympus). His imperfections make him all the better though. Nobody is perfect, and I don't want characters to be perfect either. I want to know that people can still do good and be heroic even with their flaws. “What I did next was so impulsive and dangerous I should've been named ADHD poster child of the year.” -The Lightning Thief, 164. Percy wouldn't be a demigod if he wasn't willing to take risks. Time and time again, he makes quick thinking decisions in order to save his friends and family. While these decisions don't always end up well, he's still willing to do things if there's even a slight chance he can make things right in the world. “Percy smiled. He knew the stakes were high. He knew this day could go horribly wrong. But he also knew that Annabeth was on that ship.If things went right, this would be the best day of his life." -The Son of Neptune, 512-513. When he duels Ares in The Lightning Thief, he makes a huge risk--his life. He has no experience fighting, and Ares is the God of War! But he does it because it's his only option to get the lightning bolt back to Zeus before the Summer Solstice. When he has a dream that Grover is in trouble, he runs away from Camp Half-Blood on a whim in order to help his friend, which leads him to battling a Cyclops and several other monsters, including Luke Castellan (The Sea of Monsters). In The Battle of the Labyrinth, he's on the brink of death fighting the telkhines, so he triggers an earthquake--which could have killed him anyways--in order to escape. He gains the curse of Achilles by bathing in the River Styx because he believes it's the only way to stop Kronos once and for all (The Last Olympian). “I looked down at my clothes. They were slashed to pieces and full of bullet holes, but I was fine. Not a mark on me. Nico's mouth hung open. "You just . . . with a sword . . . you just—"
"I think the river thing worked," I said. At the end of the first series, the gods give him the option to be immortal, but he refuses. Instead, he confronts the gods for their actions: ignoring their children and each other. He demands they take more time to care for their children, the lesser gods, and Camp Half-Blood. This was a risky move because the gods could have become angry and killed him right then and there. But he has to try; if he doesn't, things wouldn't get better. So he gives it a try, and it works. When he takes risks, they don't always pan out perfectly, but he does it in order to uphold what he believes and protect those he loves. 'All in favor,' Hermes said. All the gods raised their hands. 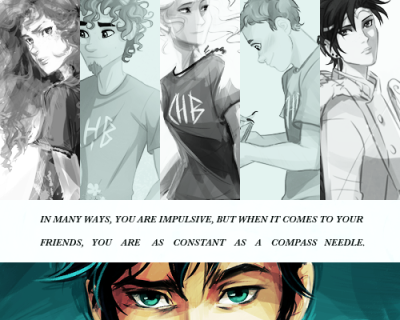 Percy's fatal flaw is the people he loves: his friends and family. He is willing to do anything to save and protect them. When his mom marries Gabe, Percy continually tries to defend her because he thinks she deserves so much more. He helps her get away from that life and have the life she deserves. Maybe if I kick you in your soft spot, I thought. And make you sing soprano for a week." -The Lightning Thief, 35. Percy also doesn't give up on her after the Minotaur sends her to the Underworld (LT 104). He still believes he can save her, no matter what. He also fights for his friends at Camp Half-Blood. Time and time again, he stands up for them and fights monsters and titans and all types of danger in order to keep the camp safe. He goes on a quest to find the Golden Fleece in order to heal Camp Half-Blood's borders (The Sea of Monsters). He takes up the burden of holding up the sky so Artemis and his friends can be free (The Titan's Curse). He refuses to surrender to Kronos even though campers have died and others have been injured (The Last Olympian). When he meets people from Camp Jupiter, he also risks his life and fights for them too--despite not knowing them as well or even remembering who he is (The Son of Neptune). He gives everything so his friends can be safe, especially Annabeth and Grover. 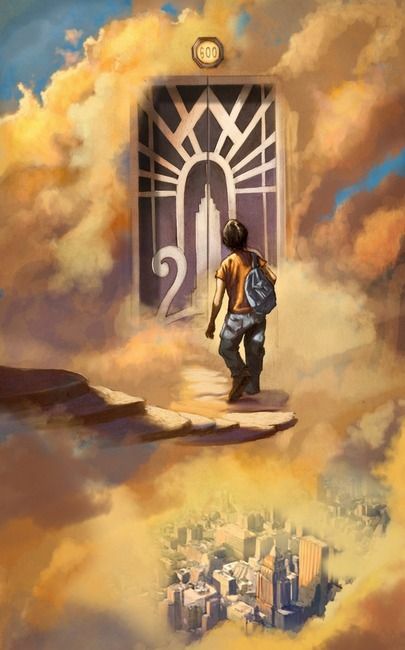 When Annabeth falls into Tartarus, Percy doesn't do everything he can to find the Doors of Death and rescue her; instead, he falls into Tartarus with her so she doesn't have to be alone (The Mark of Athena). "Percy tightened his grip on Annabeth's wrist. His face was gaunt, scraped and blood, his hair dusted with cobwebs, but when he locked eyes with her, she thought he had never looked more handsome. 'We're staying together,' he promised. 'You're not getting away from me. Never again.'" -The Mark of Athena, 568. Percy fights for who he loves. He doesn't give in. Ever. He continues on, persevering until he can't anymore. And then he keeps going. "'In each case, your loved ones have been used to lure you into Kronos's traps. 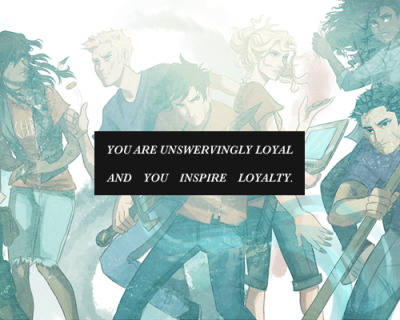 Your fatal flaw is personal loyalty, Percy. You do not know when it is time to cut your losses. To save a friend, you would sacrifice the world. In a hero of the prophecy, that is very, very dangerous.'" -Athena, The Titan's Curse, 298. Percy Jackson might not seem like a gentleman due to his impulsive nature and ability to make stupid decisions. But when you get to the heart of the matter--that everything he does is for the people around him--his flaws and risks seem more important, more genuine. Percy Jackson has a deep heart for those he cares for. He'll do anything--dangerous, stupid, even brave--to save them. 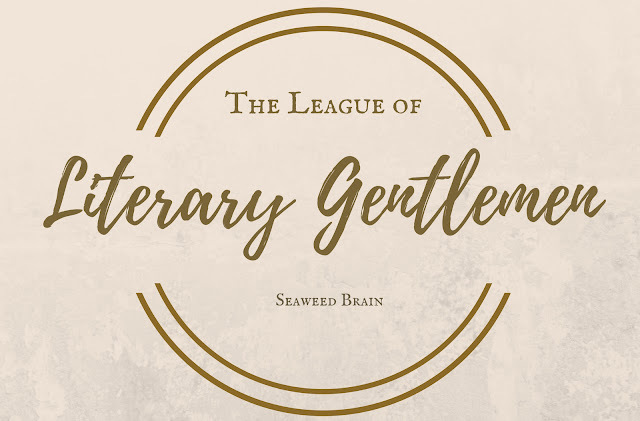 He may be a seaweed brain because of it, but at least he's a heroic seaweed brain. All quotes are from the Percy Jackson and the Olympians and The Heroes of Olympus book series by Rick Riordan published by Disney-Hyperion: The Lightning Thief ( 2005), The Sea of Monsters (2006), The Titan's Curse (2007), The Battle of the Labyrinth ( 2008), The Last Olympian (2009), The Lost Hero (2010), The Son of Neptune (2011), The Mark of Athena (2012), The House of Hades (2013), and The Blood of Olympus (2014). You know, it is funny. 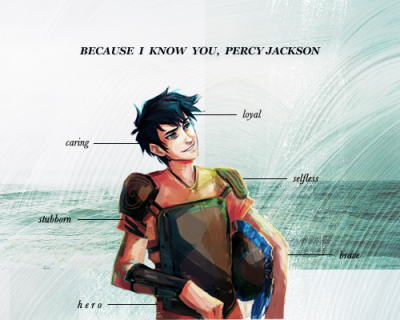 I never once thought of Percy as a like-likable person in the whole of The Percy Jackson and the Olympians series. Not at all. And it was my favorite series for like, three years! Funnily enough, however, it was only when I started to read Heroes of Olympus (a series which never compelled me enough to read it) I actually thought Percy Jackson was easily the kind of character I could fall in love with. I'd like to think that's ironic, but maybe not. You know, I think I felt the same. When I read the Olympians, Percy was a character I wanted to be best friends with, not in love with, but in Heroes of Olympus, I was swooning. Maybe it's because I read PJO when I was 15 & Percy was mainly 12-16 years old, but in Heroes he's older? I don't know.